Welcome to Oakwood Motor Company, Audi specialists & prestige used car dealer in Bury, Manchester. We are a used Audi dealer stocking the best of used Audi and prestige performance cars for sale in Bury. You are welcome to come and visit us at our indoor used car showroom and browse our extensive stock. We can give advice and guidance on any purchase of our used Audi for sale. We offer used Audi finance and part exchange, all our used Audi and prestige cars come with a standard used car warranty and pre delivery inspection. Open 7 days a week allowing you the chance to call and see us when you find it convenient. We offer star treatment to all our customers but some attract a little bit more attention than others. Read our press release page to read more of where we've sourced some of our used car stock for sale to you. Click the image below to view these as a PDF. 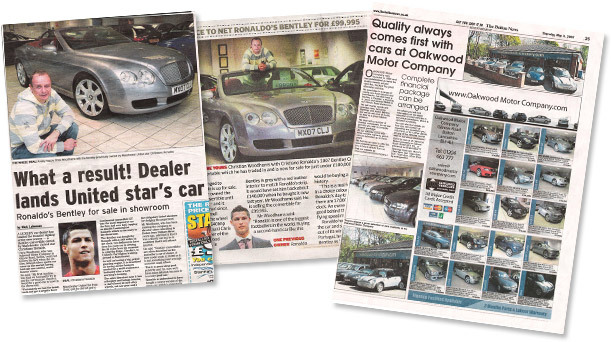 Visit Oakwood Motor Company used car dealers in Bury, Lancashire, selling cars from our prestige car dealership.